The couturier cast his spell once again with a collection beautifully detailed with fur and exquisite handwork embroidery on shift dresses, velvet slip dresses and kaftans. The menswear collection was nothing short of spectacular with its regal floral motifs. We were besotted with the chandelier-laden ambience which highlighted the collection’s 70s decadence. The live music by the Symphony Orchestra of India was a wonderful addition to the spirit of Indian regalia. Sanjukta Dutta’s collection, for which Bipasha Basu was the showstopper, was an amalgamation of cultures with temple motifs from South and colourful silk threads from Assam. She also experimented with different ways of draping the sari which we really appreciated. We admired the motifs from Sumona Parekh’s collection, for which she chose Sophie Choudry to be the showstopper, were derived from social & religious customs. Although we dig the intricate gold work in Architha Narayanam’s collection, we felt like showstopper Karisma Kapoor’s red asymmetrical gown belonged in much older seasons. Saroj Jalan’s called ‘Gulzar’ was inspired by a beautiful poem penned by the great Aamir Khusro. The deft use of zardozi, hand woven tusser silk and velvet enhanced the beauty of the classic couture garments. We wish showstopper Radhika Apte’s outfit wasn’t so heavy on design; a relatively cleaner ensemble would have worked better. The menswear designer’s collection, titled ‘Role play’, transitioned from bold shades of wine to neutrals like ivory, charcoal and olive. We got to see Kunal’s take on the sherwani and shorter versions of the Pathani kurta as well as staples like Bundis and jackets. We were quite taken with his tribute to botany in a more abstract geometric manner with marigolds and roses forming rich 2D silhouettes. 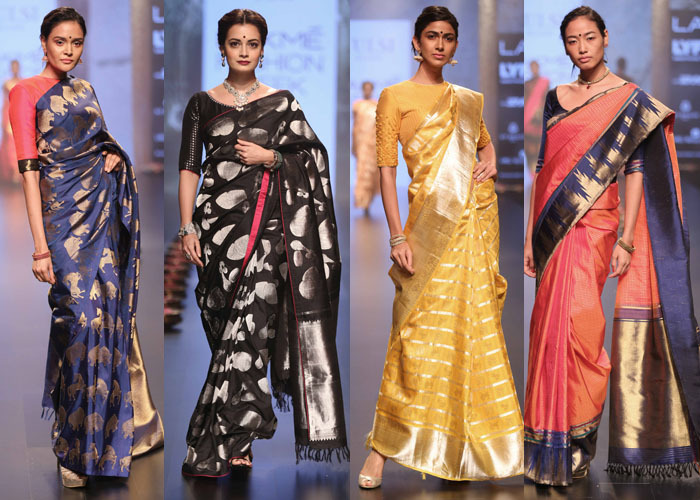 Called ‘Woven Tales of Kanchipuram’, the collection by Tulsi Silks showcased stunning versions of the 6-yard Kanchivaram weaves in different colours and patterns. The range was further broken down into mini-collections like ‘The gold animal’, ‘The revival’ and ‘The gold bridal’ among others. We enjoyed the metallic saris in mint greens, reds, mustard and blush pinks. The horse and elephant motifs were beyond adorable. 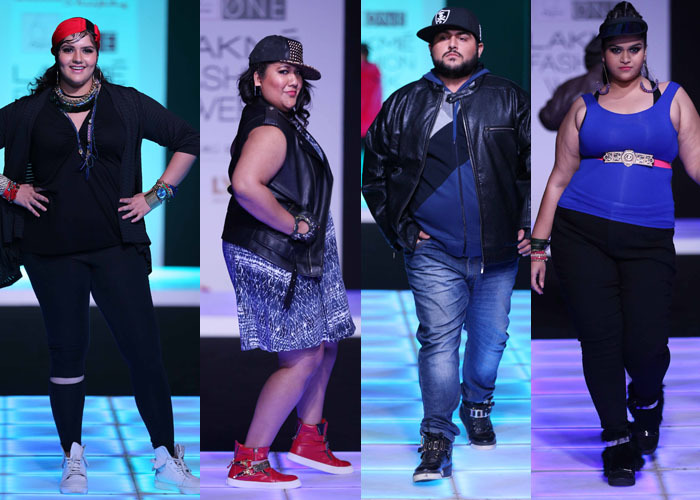 Presented by the ‘aLL’ label and expertly curated by Little Shilpa, this show was a colourful look at fashion for the plus-sized. The designer showcased high street casual and daily athletic wear royal in the form of a blue mini number layered with a hooded checked monochromatic shirt and a printed summer dress teamed with an edgy leather jacket. The denim-on-denim look was attempted with a pop of neon to make it look off-beat and modish. Although we laud the designer’s endeavour to curate clothes for a plus-sized label, we felt like she could’ve opted for more tasteful shades. A beautiful array of colours and fabrication inspired the collection by Sonam and Paras Modi. You could also see hints of ancestral art in the garments which made it look quite regal. We totally dig showstopper Prachi Desai’s off-shoulder blouse with the attached cape and royal blues and greens that we saw throughout the collection. The ‘Itvara’ collection, which means traveller, saw traditional craftsmanship and handloom fabrics on feminine silhouettes. The all-natural silks, linens and cottons lent a very soulful feel to the showcase. We felt like showstopper Pooja Hegde’s monochromatic outfit was too casual by showstopper standards. An ornate top would’ve made the outfit look more chic. The inspiration for the designer’s collection, titled ‘The Wedding Chronicle’, was drawn from the new-age girl that redefines and embraces minimalist glamour with a classic twist. 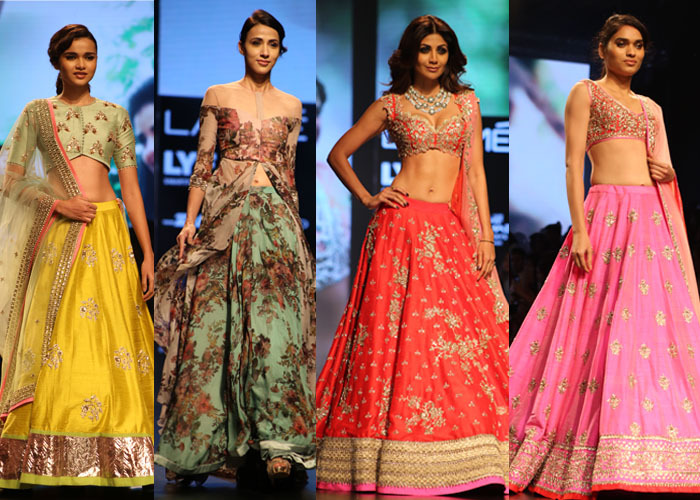 We also saw Anushree’s signature colour play with hues of tangerine, fiery red, rani pink and yellow with detail to the placement of motifs. We loved showstopper Shilpa Shetty’s scalloped zardosi lehenga embroidered with intricate handwork in subtle golden shades. Handwoven raw silks and luminous chanderi bases were transformed into uber chic and fluid silhouettes like kimono jackets, overcoats, blazers in the duo’s collection titled ‘Lakshmi’. The gleaming separates were embroidered with delicate threads and zardosi. Although we found the loose forms and the innovative treatment of the kimono quite agreeable, we wish they had used a brighter colour palette to highlight the zardosi work better. 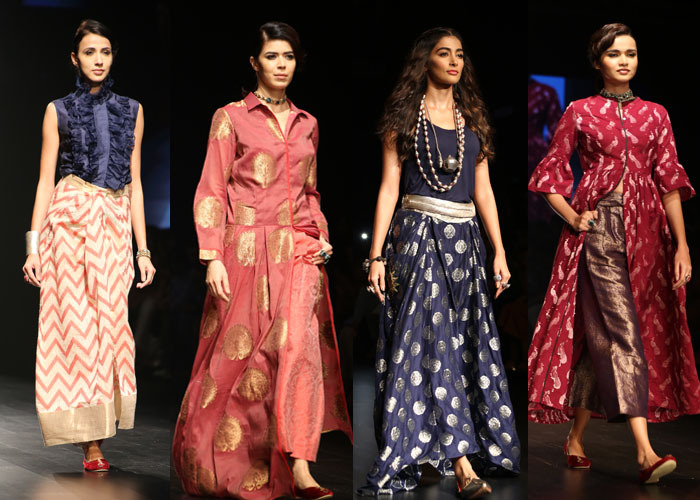 The designer’s collection was inspired by the Pichwai paintings of Nathdwara in Rajasthan. A beautiful compilation of patchwork and applique with antique marodi embroidery was tiered over gorgeous shibori prints on pure silk. We liked that the main colour palette was black while a host of colours like beige, onion pink, vermillion, tangerine, crismson and mint were used to bring out the silkwork more prominently. The designer’s collection was infused with indo-western vibes, pairing ghararas with short tops and gowns with gold embroidery. Although design was the hero of this collection, we felt that the gold embroidery got a little repetitive as the showcase progressed.